Flood made his major-league debut against the Cardinals. On Sept. 9, 1956, at St. Louis, Flood, 18, was a pinch-runner for Smoky Burgess, the stocky Reds catcher who hit a double in the eighth inning off Cardinals starter Murry Dickson. As a September call-up, Flood played in five games for the 1956 Reds and three games for the 1957 Reds. The Cardinals were the opponent in three of those eight games. Flood and outfielder Joe Taylor were traded by the Reds to the Cardinals for pitchers Willard Schmidt, Ted Wieand and Marty Kutyna on Dec. 5, 1957. It was the first trade made by Cardinals general manager Bing Devine and it was one of his best. Devine credited Cardinals manager Fred Hutchinson with encouraging him to make the deal. Flood, who won seven consecutive Gold Glove awards as a Cardinals center fielder from 1963-69, played two games at third base and one at second base for St. Louis. At 5 feet 9 and 165 pounds, Flood was an iron man. He played in 150 or more games in a season seven times. 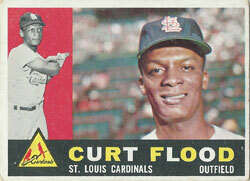 Flood ranks seventh all-time in games played as a Cardinal, according to baseball-reference.com. Five of the six in front of him have been elected to the National Baseball Hall of Fame. The top seven in games played for the Cardinals: Stan Musial (3,026), Lou Brock (2,289), Ozzie Smith (1,990), Yadier Molina (1,870), Enos Slaughter (1,820), Red Schoendienst (1,795) and Flood (1,738). Flood ranks among the top five all-time in most singles by a Cardinal. Musial heads the list, with 2,253 singles, and is followed by Brock (2,029), Ozzie Smith (1,529), Schoendienst (1,498) and Flood (1,454). Flood often was at his best when facing the best. _ .394 (13-for-33) vs. Don Sutton. _ .326 (29-for-89) with a home run vs. Warren Spahn. _ .319 (44-for-138) with two home runs vs. Don Drysdale. _ .296 (32-for-108) with two home runs vs. Sandy Koufax. _ .286 (34-for-119) with four home runs vs. Juan Marichal. _ .286 (14-for-49) with two home runs vs. Ferguson Jenkins. Flood was an integral member of a Cardinals franchise that won two World Series championships and three National League pennants in the 1960s. In 12 seasons with the Cardinals, Flood was a three-time all-star who hit .293 with 1,853 hits in 1,738 games, including two consecutive seasons (1963-64) with 200 or more hits. When the Cardinals traded him to the Phillies after the 1969 season, Flood refused to report and instead challenged baseball’s reserve clause, paving the way for free agency. I loved how he’d dig in against Drysdale, and you could see Drysdale thinking he could overpower this little Curt Flood guy. Who the hell was he?